For the past ten years at OTH, we've tried to deliver a killer annual Halloween list that doesn’t always pander to the obvious. Sometimes, that involves digging deep, moving beyond those childhood and teenage staples in an effort to expand horizons and capture the true breadth and width of the Halloween spirit. But let’s be real: sometimes, you just want to go back to that comfort food and spend some time with the icons that made you a horror fan in the first place. 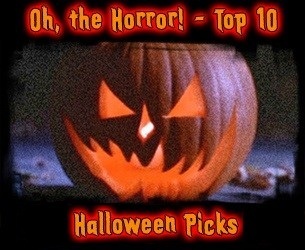 With that notion in mind, we’re here to pay tribute to those hallowed franchises with a bonus Halloween list, albeit in unconventional fashion: rather than highlight the immortal originals, we’re here to praise specific sequels that keep us plunging straight into a bowl of popcorn as they entertain us on a yearly basis (or, in the case of Halloween 4 & 5, a daily basis on AMC towards the end of the month). These may not represent these horror icons’ absolute finest hours, but they are among their most purely entertaining and are fit to grace your television screen at any given moment throughout October. In October, one icon obviously reigns supreme, and this—his big, much-hyped return after a long absence from the screen—epitomizes the franchise comfort food we’re looking for here. While the sheer elegance of John Carpenter’s original is hard to come by here (ditto for Halloween 2’s sense of witching hour menace), Halloween 4 represents a reasonable stab at returning The Shape to his former glory. Even if Return takes an obvious cue from the splatter movie brutality that defined this era, it at least attempts to honor the original’s commitment to character investment by introducing Myers’s niece Jamie and her quaint, loving family. Dr. Loomis (Donald Pleasance) is of course back as The Shape’s maniacal foil, warning anyone and everyone about his imminent return to Haddonfield, where he resumes the bloodbath he started a decade earlier.